Another goal of mine was to highlight Amy and Jen's versatility in terms of decor options and design services. 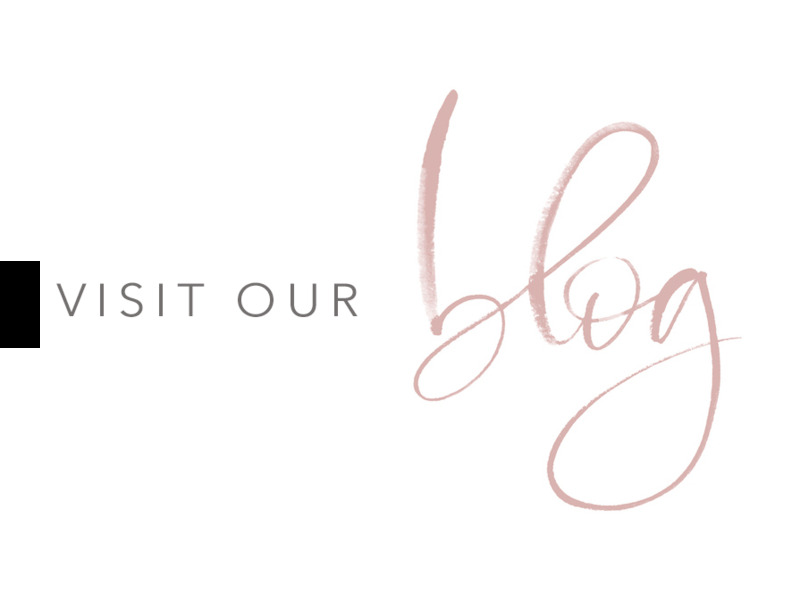 I truly believe we have something to offer to all clients (regardless of style or budget!) Despite the unique aesthetic of this shoot, I was able to easily choose pieces from our collection. Ultimately, it was our decor and our incredibly talented vendors that helped make my vision a reality. The large windows in the gallery bring in gorgeous light and shadows, so I chose a softer colour palette to contrast the moody space. 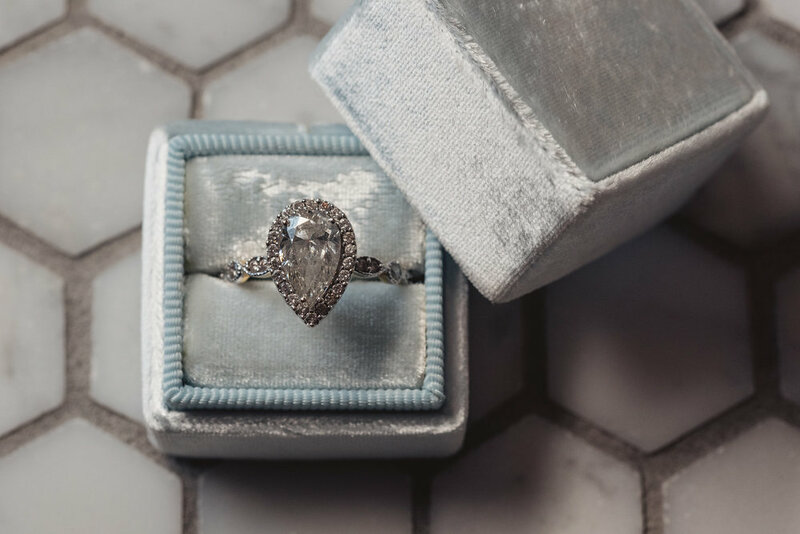 Creams, greys, rose quartz and blues came together to create a soft, romantic vibe. 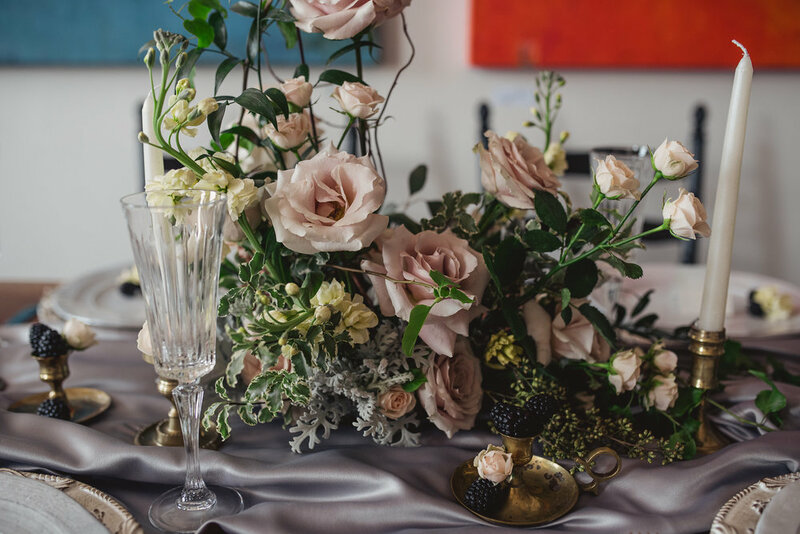 Our floral designer, Belle Époque Floral Design, created the perfect centrepiece for our tablescape, and our Verona chargers handcrafted in Italy served as a focal point. These chargers are beyond gorgeous and one of my favourite new additions to the Amy and Jen collection. Not only did they pair perfectly with our antique harvest table and black wood chairs, but they added just the right amount of romance to our tablescape. I also used gold candlesticks, grey satin and small dark accents (such as blackberries) to keep with the darker feel and incorporate different textures. 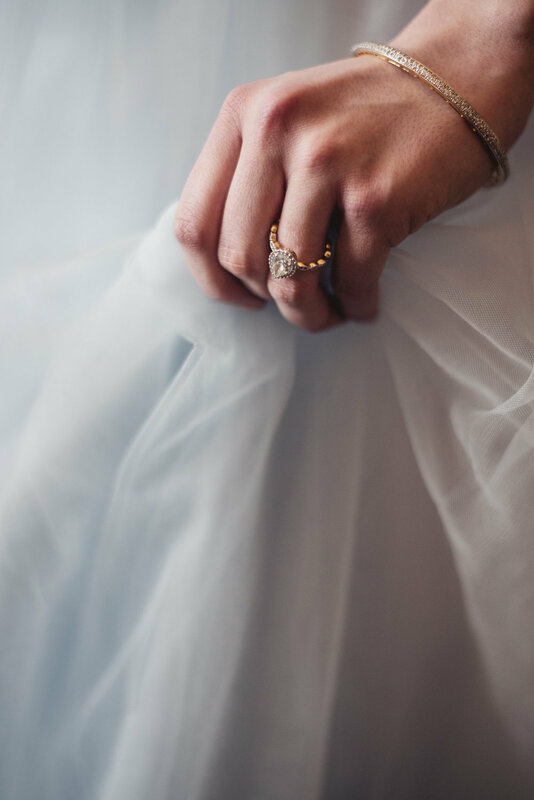 Our bride – a real life ballerina – wore a lace top and tulle skirt from Revelle Bridal, complete with satin pointe shoes. 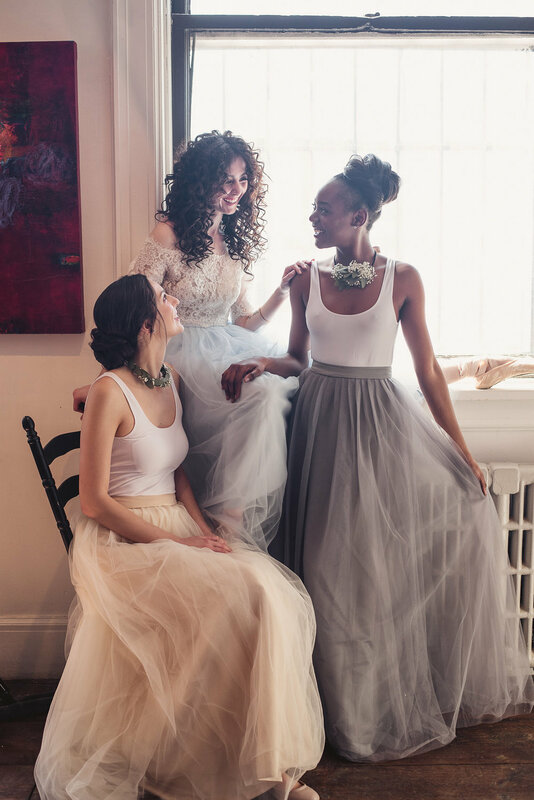 While our bride's skirt was her "something blue", her bridesmaids wore neutrals of cream and grey. We watched in awe as she twirled on pointe, her floral whip in hand and tulle skirt a delicate contrast to the modern art and dark floors of the gallery. Last but certainly not least, soft but dramatic hair and make-up by talented Lori Dyck of Showpony Hair and Natalie Peachy completed her look. I knew I wanted to incorporate sweets into this shoot and the cakes and confections of Osso Sweet fit our vision perfectly. Placed on our wooden crates and glass stands, they could not have been more elegant. Our caterer, Bouffage Kitchen, also provided beautiful canapés. 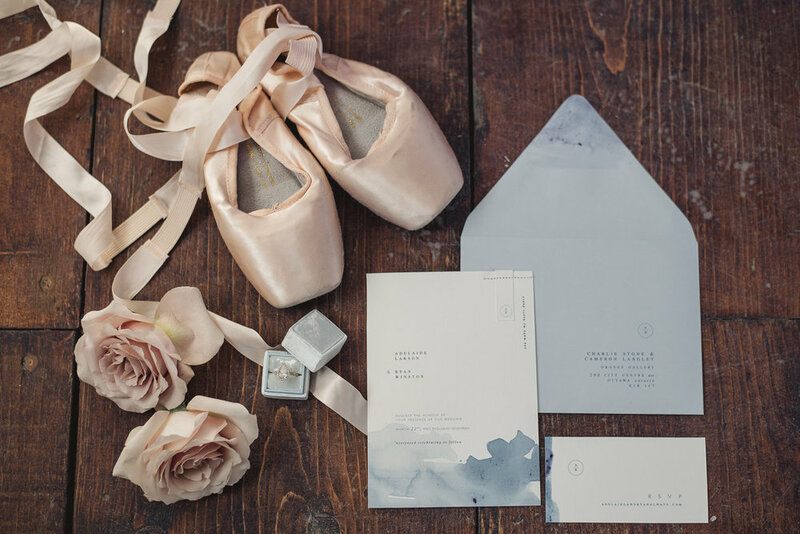 For our invitations, Christine Breton of LaFabère created a gorgeous water colour invitation suite which we styled with Stor by Margot's stunning Kate ring – another perfect fit. A huge thanks to our talented photographer (Charlotte Northrope) and videographer (Matt & Kat Films) who captured the movement and grace of this shoot so beautifully. I am beyond thankful to you both.